WOW that looks like a crazy fruit!!! Where do you find them? What do they taste like? 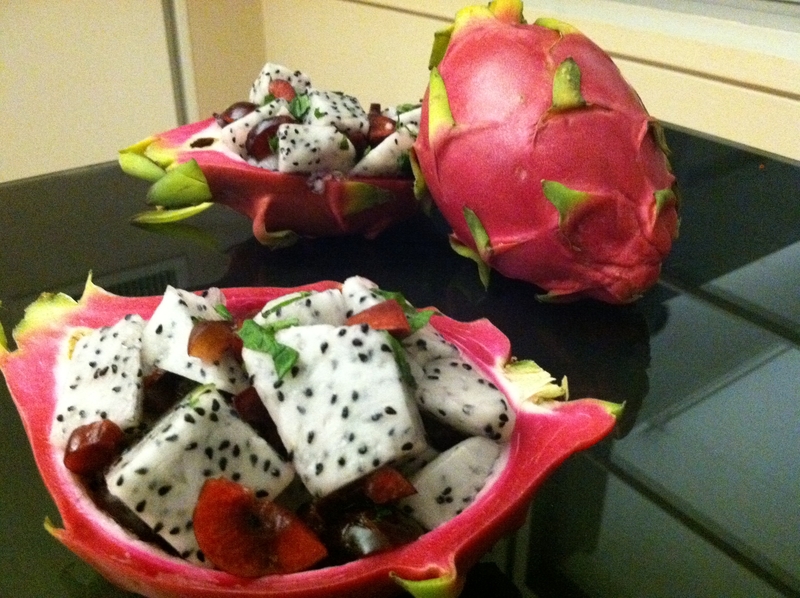 Hi MIchelle – you can find them in almost any Chinatown grocery market in the produce section. They don’t have much taste actually. Their consistency is like a kiwi, but the flavor is very very mild. I think it’s great chilled and with other fruits. hey michelle. yeah its got kind of a sweet taste, sort of light kind of sweet taste. not very rich, but it is good. you can cut it the long way but i prefer it the other way. all you do to eat it is eat out the flesh with a spoon! your spoon sinks right into it, like butter. the seeds taste a little funny, but you dont really bite into the seeds very often. How do you know if they are ripe? If the fruit is a bit soft to the touch (similar to an avocado or a kiwi), I find them deliciously ripe for me. The color should still be consistent across the fruit (uniform, not brown or splotchy). Also, the give should be similar to a kiwi – slightly firm yet soft. If it’s too ‘mushy’, it’s overripe and too hard it’s not ripe enough yet.